I wish someone told me, I wish I realized sooner. Drafting a sloper is easy. I mean really easy. 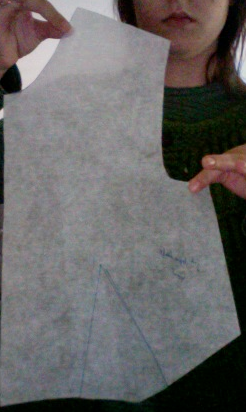 Easier than trying to make a ready-made sloper pattern fit. Often it is too easy to mystify unknown aspects of sewing. I over-mystified this to the point I made myself believe I had to be some sort of Chanel-esque mastermind to be able to draft a basic sloper from my measurements. Wear a properly fitting t-shirt, make sure the side seams correspond to your side seams. That makes it easier to take back and front depth measurements. Otherwise, wear nothing but your unders. I marked the end of my shoulder seam by lifting my arm above my head. You should get a little dimple in the shoulder. Mark that dimple. Use it as your reference point. Wear a necklace. This is a reference point from which to measure CF, CB, shoulder length, and shoulder to waist lengths. Tie a little piece of elastic or cord around your waist (narrowest point) and allow it to settle. Wear a properly fitting bra. By the way, this book has bra drafting! When measuring for point B-J on the front, remember you’re not measuring your high bust or your full bust. It is simply the point between the tops of your side seams. My long-suffering husband took my measurements. It was pretty easy although I wanted inches and he knows centimeters best. With those guides in place (waist elastic, necklace, etc) and the little diagrams on the page, we had no problems. When we took my first set of measurements, we guessed at where my waist “should” be, where my neck “should” be and rounded to the nearest quarter inch. The sloper was a mess. It kind of worked, but not really. 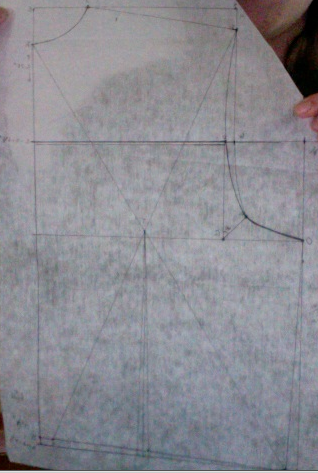 For the second, I tried to measure myself. Also a bad idea, though it was better. For the third, I carefully marked myself and then he measured. Much, much better. I think all the lines and angles scared me initially. Lo and behold, the only precise angles are right angles, and some 45 degree angles for the armscythe. All you have to do is get your measurements, follow the instructions to draw the dots one at a time, label the dots, and connect them. Really. That’s it. I *think* this is the classic RTW B-cup. 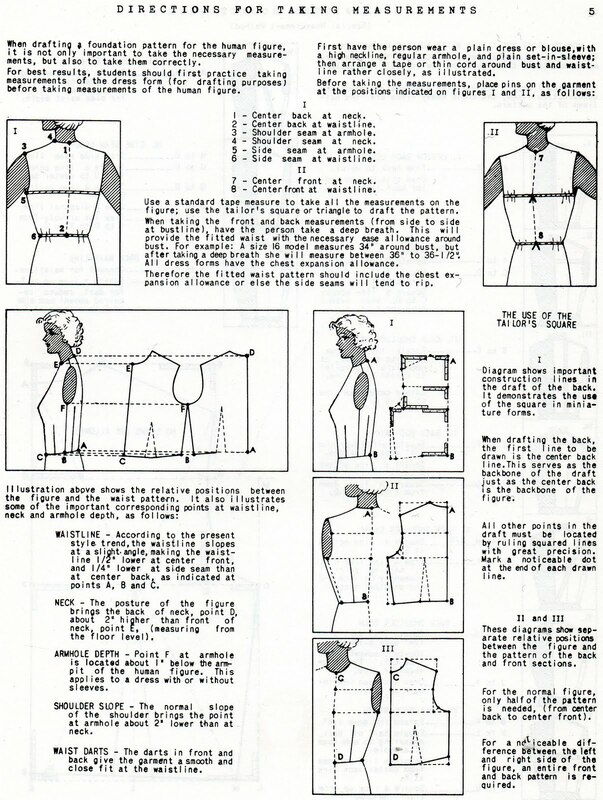 Notice the special instructions at the end of the bodice front draft. I followed that carefully (easier than a FBA) and the sloper fits my D’s nicely. That is to say, the pattern pieces pinned up fit me. Unfortunately, by the time I made three drafts I’d eaten up all my free time for the weekend. Well, not all of it, I did get sucked into Dr. Who and some knitting last night. After three fronts and three backs, I drew a good set. The first set of fronts and backs took me a good 2 hours, which was considerably less time than I expected. The third set took half an hour. I suspect that making my own patterns from my sloper will take considerably less time than pattern alteration, with better finished results and much more creative control. I still need to stitch these up in muslin to be sure, and I need to draft the hip-length dress foundation in order to be able to make some blouses. I will post my finished sloper later tonight after work, but I wanted to waste no time empowering you! You can have impeccably fitted, gorgeous clothes without paying out piles of money or putting inordinate amounts of time into it. You can you can you can! I’ll stitch that sloper together tonight. This entry was posted in couture, Drafting. Bookmark the permalink. I hear you, and I will (someday…). Thank you for all the details. 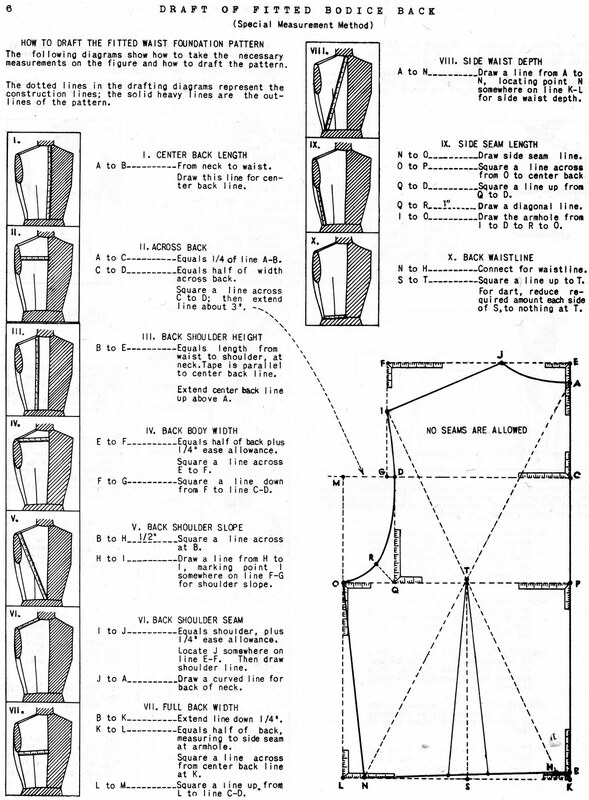 What book did you use for your sloper instructions? Hmm. Maybe I should finally do this. What book are you using? This is awesome. 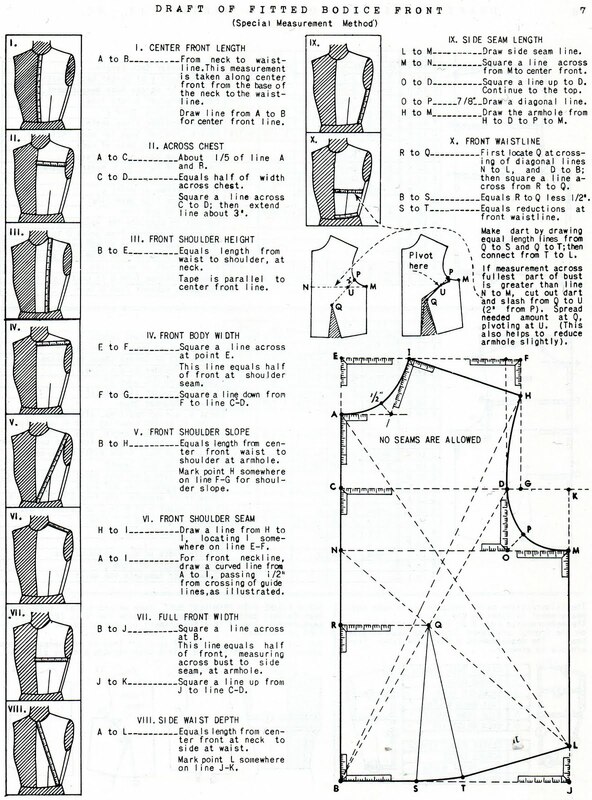 You know I've been putting off doing my own sloper for months now…maybe I'll try this method instead! I do have the McCunn book, everyone says it gives great results. I'm going to take a look at this too! Do it sarah, just do it. I want to see what results other people get from the same sloper/different bodies. It took me one nap time to get the hang of it, and probably the equivalent of another nap time to make a nice one. No Herculean task here. I'm set – I'm going with the Harriet Pepin and I'll start when I'm back home (in…a week or so). Of course, getting help with my measurements will probably take longer than all the rest put together!! I hope more people will follow suit – even if they're just used for alterations and grading it seems that getting good fit will be so much easier.